More details about the plot, setting, and classes for Bungie's latest game spill forth. Since its initial reveal, Bungie has been rather tight-lipped about Destiny. It's had a lot to say about how it learned from Halo and how it wants to push into bold, new territory, but the actual meat has been scarce so far. Yesterday, Bungie silently updated Destiny's website with a host of new information about the setting, enemies, and player classes for mysterious upcoming shooter. According to the new entries, in the future something really terrible happens to humanity. No one's quite sure what it was, but the very few who remain survived thanks to a mysterious orb known as The Traveler. The remnant live in The City, a refuge protected by The Traveler's energy shield. Outside of that safe area, the Earth has become a feral wasteland claimed by both nature and alien enemies. Some early exploration has happened on the Moon, but it seems too dangerous to learn much right now. Meanwhile, entries for Venus and Mars exist, but remain blank while "awaiting reports from the Vanguard." We even get an insight into the various player classes as well, giving us some context to go with the teaser video. As a Guardian, players wield portions of the Traveler's power to protect the last Earth city, as well as forge a new path for humanity. Warlocks, the obvious mage class, have mastered the Traveler's arcane energy. 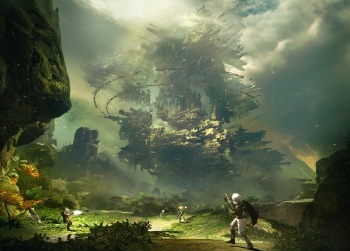 The Titans were the ones who built the Wall around the City and are the ones in charge with protecting it, while the Hunters brave the wilderness beyond. There're far more than rats outside the Wall. Two enemy races have been revealed so far, The Fallen and the Cabal. The Fallen are engaged in a massive human extermination campaign and have a presence on every planet and moon humans have touched, seemingly out of spite. Meanwhile, less is known about the Cabal, except that they seem to center around Mars. While Bungie talked a pretty big game, especially at the PS4 unveiling, it's good to finally see what they had in mind. When Bungie finishes marinating Destiny in the secret sauce, it will launch for both current and next generation consoles.